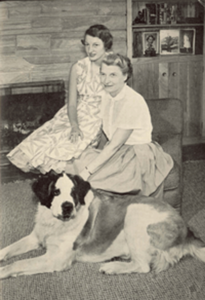 Rosamond du Jardin was one of the most popular authors of girls series fiction in the 1950s. Her Tobey Heydon and Pam and Penny Howard books are among the most beloved teen romance novels of their era. Rosamond du Jardin first wrote humorous verse and short stories for newspaper syndicates, then went on to sell approximately a hundred stories to such magazines as Cosmopolitan, Good Housekeeping, McCall's and many other publications, abroad as well as in the United States. She also wrote five novels for adults before her first novel for teenagers, Practically Seventeen, which was published in 1949. In addition to writing, Mrs. Du Jardin frequently spoke at schools, and students enjoyed meeting in person the creator of some of their favorite stories. Mrs. Du Jardin enjoyed her school visits, too, because she liked and respected teenagers as individuals and firmly believed that they are interesting, normal and dependable people. Born in the small town of Fairland, Illinois, Rosamond du Jardin was two years old when her family moved to Chicago. She lived there and in the Chicago suburbs for the rest of her life. Pictured left: Judy, Rosamond, and Lana. Lana was the inspiration for the Zeta Mu Fraternity St. Bernard mascot, "Baby," in The Real Thing?